When growing up, I wasn't aware of age. Perhaps I didn't notice until I had teenaged children. There were no ages on Neff Road. Friends passing through our house at the farm ranged from the elderly to the teenager to the child. The friends from the church, those who came from other parts of the world, those who lived on Neff Road, they visited Mom and Dad and included us in their conversations. Age was invisible. Then I was an adult. Friends came in all ages. I worked at the school and taught acting. Our home became a kids' hang out. They popped in for visits and when they needed a friend to listen. Our involvement in the church, gave us dear friends who were older as well as those our own age. Many of those friends have continued to be dearer over the years. One of our teenagers, now a grown man, asked me to be god-grammy for his kids. Another meets with me weekly to work on books and projects. This list goes on. On trips back to Ohio from Oregon, my visits revolve around old friends. They are the parents who watched me grow, the neighbors who nurtured me and the extended family I cherish. No longer just my parent's friends, they became the people who corresponded with me over the years. They were my friends. Oregon is much different. Neighbors do not neighbor much. Everyone is quite content to go about their own business. Most times kids are not invited to the parties and celebrations. Perhaps this is why I try so hard to include my kids and granddaughters. It matters. Throughout my lifetime age as been an invisible commodity. I never saw or felt the difference. The people of rural Darke County didn't talk down to the children. They didn't build their lives apart from their children. We were included in all activities. Neff Road is as ageless as the people who resided there carrying friendships that covered miles and next generations. Perhaps this is why Neff Road is still home. The Today Show had a segment on how to decorate a mud room. It struck me as funny remembering what we considered the mud room on the farm. Our mud room was in the basement. When we were snow covered or muddy, we came into the house the back way through the basement. On the stone wall of the basement was a row of hooks that held coats for all seasons. Boots and muddy shoes were taken off and hands were washed washroom. There was no decorating of the mud room. In reflection, it would have been silly. In the summer we sometimes entered through our backroom. The backroom was a place mother canned, made soap, placed pies to cool. Next to the backroom was the 'old' backroom where Dad stored the lanterns. That room had a dirt floor. I suppose that with some hefty flooding, it could literally become a mud room. When I was married, we lived in an old farm house on Teagues South Road that had several rooms considered backrooms or mud rooms. There was the laundry room next to a little walk-in pantry and the backroom with an adjoining room where coal had been stored. These backrooms were old and creepy. We didn't live there long enough to decorate our mud rooms. So I chuckle at mud room decorating. The professionals suggested a cute little rack standing against a wall behind an overstuffed chair. Small bins were placed for gloves and hats with a shelf for boots. Just cute. When my children grew up, they walked in the front door. Handed me their coats, plopped their boots on a rug and took off. My granddaughters hang coats and book bags on my antique, hall tree, mirror. Boots and shoes are tossed, mine in the mix. We try organize but most time it just doesn't happen. We head for fun as fast as we can. Never thought of planning a mud room. Never wanted to clean up a mud room. Hooks and rugs. Good enough for me. It's raining. Maybe I should go play in the mud. She had been mine since 7th grade when Dad and Uncle Jim pulled the truck into the driveway pulling a horse trailer behind. I leaned on the wide ledge of my bedroom window wondering at the activity in the yard. Uncle Jim opened the back of the trailer, and I was in the window no more. Dad's big Belgian work horses were gone by the time I was a born. The old harnesses and yokes were the only reminders of another time. Dad would tell me about the beautiful matched team that had helped him farm, hulling trees from the creek bottom to the building site of the new barn. How I longed to sit astride one of his beloved horses. Playing cowboy was just something we farm kids did back then. Dad would tie a piece of twine around the end of a tobacco lath, and I would ride around the farm chasing bad guys. Most times I was Roy Rogers. I knew it would be my only horse. There would never be money for such a luxury. Hanging out at the horse barn at the fair gave me a taste of what it would be like to have a horse. 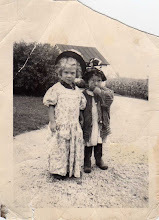 As a tyke I sat on a live pony that walked behind another plodding around in a circle. Our friends, the Eliker family, had a horse in the fair horse barn. The smell of horses and the chance to pet a nose peeking out of a stall were worth the trip to the fair. Oh, how I wanted a horse. I'm not sure how I managed to contain myself when I saw this beautiful bay quarter horse standing by the barn. She was huge. Her coat was dark, reddish brown with a black mane and tail. A small white star sat between her sweet, dark brown eyes. Dad handed the harness strap to me and told me her name was Cherry, she was mine. Not every child gets to have dreams come true. I didn't know what it would feel like. My imaginings didn't come close to the real thing. Dad explained that when Uncle Jerry (the man who taught me to love singing) had died, his horse and tack were to be given to me. Uncle Jerry was surely smiling looking down at this girl he loved loving his beloved horse. Cherry and I had our adventures. She was a trained horse, and I was untrained. I learned to understand her gaits. Yet sometimes when we were walking at a slow pace, she would go into a trot or a canter bouncing her rider all over the place. We learned about each other. Horses will gorge on corn should the opportunity present itself. Cherry escaped through a hole in the fence into the corn field. I walked non-stop the rest of the day and into the night trying to keep her on her feet singing the song Uncle Jerry taught me, "Over the Rainbow". Tears stained my face; she plodded along. The next morning she was dead. It was the first day of my senior year. Wow, I still cry thinking about it. There is something everlasting about that relationship with a pet. Even one as large as a horse. I bushed her coat, combed her mane and loved her. She nuzzled me, nibbled at me, was my friend. Dreams can happen but at a price. My dream came in a trailer that day. So children, dream. Dreams can come true. Last night we celebrated my granddaughter's eighth birthday. The family sat around the table eating pasta and ice cream. Gabby opened her presents An evening of celebration. A celebration all captured on camera. Recording our family history. We have pictures of my grandparents with their families and the same for our great grandparents. Tin types, pictures glued to cardboard. Some pictures are in folders while others are on post cards. Smile. The professional photographer aimed the camera and captured our family, me standing between my two seated sisters. Mom and Dad smiling stood behind us. We didn't realize how precious this picture would be to us some day. The photo portrait captured me with long curls made when Mother wrapped my hair around a fat pencil. My sisters were teenagers so young and lovely. Mom and Dad were captured at an age that I would not remember. We stood in front of the sign: Virginia. Later: New York. Mom or Dad held the box camera while their daughters, and their youngest with her favorite doll Amosandra, stood in front of each sign at each state lines. I don't remember much of the trips, but I do remember standing in the ditches in front of the signs. My sister got a Brownie camera. It was compact with a long cord so she could hang it around her neck. The box camera gave way to the sweet, little Brownie. Film was developed at the pharmacy. We waited and waited. When I was in high school, the waiting became obsolete when with the Polaroid. Black and white was replaced with color. A whole new world of photography. Now I pull my little Canon from my purse. Aim. Shoot. In seconds I can see the picture I've just taken. When I go home, I send it off to the family, so they can see Gabby one year older. I miss the black and white pictures. The intensity of the faces perhaps starker seemed much more real. Pictures were taken by a photographer with a huge camera and a powder flash. Now instead of waiting to see my pictures they reside in my computer never quite making it into paper form. The camera: a recorder of history, the keeper of memories, a link between then and now. At Franklin Monroe Elementary School back in the dark ages, all second graders had the opportunity to ride the train. I'm not really sure where it started and ended. I believe it might have started in Greenville and ended in Bradford or Piqua. A great experience for small farm kids. I remember standing with my classmates and our teacher Miss Gordon. She was a white haired woman who reminded me a bit of my Aunt Alma. Maybe that is why she was one of my favorite teachers. We stepped up the stairs into the train car. Each step for us a thrill. I sat by a window watching farms pass praying I wouldn't get car sick. When we disembarked we were permitted crawl up into the engine. It belched steam, the whistle blew, and we were thrilled. Our class was once more placed onto the train. This time we headed to New York City for our senior trip. Radio City Music Hall, the Empire State Building, China Town. Most memorable? Our trip to the World Expo. The huge globe reigned over the international courtyard as we visited the world that day. The sky tram took us from Asia to South America. Our small world grew once more. The return trip to rural Ohio was solemn. In our investigation of the train, we discovered a coffin in a cargo car. A young man was returning home from Viet Nam. As seniors, we foresaw the future after graduation. We knew. We feared. As a graduation present, my sister and her husband took me by train from Indiana to Chicago. I marveled that we could not see the stars within the city. I wondered at the children who had never seen the night time beauty of the sky. We rode the monorail. We passed through the slums. The ciy teemed with sailors in port before they shipped out to Viet Nam. A restless world in a restless time. Trains. A history of America. A history of the class of 1965. Last night I went to a Halloween party as a hippy. An aging hippy. I wasn't a hippy back in the 60's. Mostly I remember mini skirts, long straight hair, pointed shoes and peasant blouses. I was a girl working in Dayton. We had no hippies that I knew of in Darke County let alone Neff Road. I did rebel. I did hate the war. First hand, I saw the devastation in Dayton with the race riots. We all sat on the edge of a leaf waiting to see which way the wind would blow. For teens it was a hard time. We took life as we could get it and prayed there would be more ahead. I worked and waited for my guy to return from Viet Nam as did my other friends waiting for their loved ones to come home. My fiance and I were not hippies, yet we did venture to go to the Lemmon Tree in Dayton. We entered the dark coffee house taking a seat along the side of the room. Gary wasn't a coffee drinker, and I had grown up on coffee. Yet, this coffee would, as my dad would say, put hair on your chest. Two country kids a little out of their element. Candles provided most of the light in the room. Simple music was played while poets shared their hearts in their words. One could not sit there without being affected by the ambience, the audience and the words. Simplicity and thought. No. I was not a hippie. Well, I was last night at the party. Yet those times in the 60's and 70's affected the me I would become. We were not immune on Neff Road. We were trying to find ourselves afraid of world at war. War of nations, war of discrimination, war of new feelings and old traditions. I grew from those days into the me I am who still seeks peace, love and understanding. In the winter, our friends, Herb and Freeda Anderson would invite us to their cabin on Grand Lake. Their old peddle organ provided hours of enjoyment. One kid would pump the peddles sending the air into the pipes while the other kid played the keys. Entertainment was provided by being with good friends. We bundled up and padded out to the lake, ice skates slung over our shoulders. I was probably around five at the time. Dad strapped the old double-bladed skates onto my boots and pulled me to my feet. He held the handle of an old broom, while I held the bristled end. Gracefully, Dad skated as his little girl swerved back and forth at the end of that broom. Later he placed to warm next to the bonfire. Someone had taken an old straight-back chair onto the ice. Mom sat on the chair, and Dad pushed her around the ice laughing and giggling like two teenagers. The night would end with the kids in jams and the parents playing cards. In the summer at the lake, our friend Herb would take us for boat rides in his fine, fancy motorboat. He knew how to show the kids a good time. We raced around the lake with hair flying and arms waving. Years later after I was married, Herb sold his boat to us. Fishing, boating, a new generation of good times. We stored the boat at Dad's when we moved to Wisconsin. A few more years later, Herb's son asked if he could buy the boat from us. It returned to where it had started. My husband and I bought a home not long after we were married, an old farmstead across the road from Freeda. Herb had died of a heart attack leaving her alone on the farm. She was the mother of a good friend and the friend of my mother, but when we moved there, she became my friend. I lost Freeda early this year. I miss her. Thank God for the memories. Dad's income consisted of the crops he sold at about $478 per year making up the rest of the $3,176 yearly income that already consisted of income from selling poultry/eggs, dairy products, livestock and a $60 loan. The operating expenses including feed, machinery/auto repair, farm upkeep, livestock expenses, hired labor, taxes and insurance totaling $1,011. Family expenses including food, clothing, personal, medical, household, furnishings and equipment, school/church/recreation totaled $522. This is for the year. Capital goods were $365. Incoming = $3,176; outgoing = $1,898. A difference of $1,278. The money to start the next year that would include seeds for planting, fertilizer, feed for livestock, etc. Observation: Baby June born on June 1st brought additional expenses for Mom and Dad. The hospital bill was $26.50, and a girl was hired to help at $9 for the month. There wasn't enough money to pay the doctor so that bill was outstanding. The baby carriage purchased in July was $6.14. Note. the gas bill for the stove was $.75. I didn't see where clothing was purchased for June who evidently wore hand-me-downs and gift apparel. Dad's cows and horses had names. Horses: Spike, Ginger and Bill each worth $150. The colt, Mike, was worth $40. The cows were Blackie, Nellie, Spottie, Guernsey, Daisy, Goldie and Flossie each worth $60. The calves Cherry, Bill and Bertha were worth $25 each. $2,000 lbs of wheat was worth $31.66. Lumber for the granary and tobacco beds that same month was $31.80. On and on it goes, this history of the farm in 1940. In almost 70 years, we have inflated beyond belief. My parents struggled then and today we struggle over the ridiculous prices we see daily. Doctor bills nearly flatten my mom and dad over the years. Today we are flattened by insurance premiums, and we don't have a doctor coming to our door all hours of the day or night as they did. I really don't know what I'm getting at today in this blog. My journey to Neff Road was a bit depressing thinking of my family then and now. Maybe you understand. I just needed to share. Red River was just a sign and two roads crossing. When I was a little girl, Aunt Welma would take my hand. We walked down the road past the barn to the corner general store. I vaguely remember the big bins of items for sale, bales of straw and hay, containers of items that could be measure out upon request. Milk came in a glass bottle. No longer is the store a store; it is now a house. No longer is there a town named Red River. Recently my cousin sent a newspaper article to me about the area where I grew up. It told about the little booming town of Red River when my parents were children. The small, old log house that was the original store long before my time still stands. I didn't know about the house when I was growing up. I wish I had. When I grew up, to everyone it was a rundown shack instead of a historical building. I didn't know that I lived near a once thriving town that faded when the railroad was built through Bradford. I do remember my Uncle Bob telling me a memory of when they pulled a flatbed wagon into the field on the southeast corner of Red River's crossroads. The Mills Brothers came out from Bradford and sang. My dad had talked about his group singing as a warm up for the Mills Brothers. Again, a rich history there at the crossroads. Another story that was passed down by my uncle was when he and his mother were at the store and two strangers came in on horseback. My grandmother asked them to come to their home for dinner. The James brothers dined with the family then headed on. There is a rich history in Red River. I only knew of the store on the corner of Red River. I wish I would have known more. I wish I would have been able to ask my grandfather about his memories. Life goes on daily without us realizing the importance of events, buildings, people who pass through our lives. We are the tribal storytellers responsible to share the places we have been, the way that we lived, the place from which we came. On my refrigerator is a picture of my mother and I standing in the old kitchen when I was a teenager. The house was later remodeled and the old kitchen disappeared as a new one graced Mom with more cabinet space and all the luxury of a modern kitchen. I love the memories of that old kitchen. Mom had a mirror over the sink. We could do dishes and still see anyone who might have come over for a visit at meal time still seated at the table. I could also see what my sister, June, was up to behind my back. When just a small fry, I took many a bath in that old sink. The stove had a neat hole in the back where the deep fat fryer resided. It sat full of saturated fat waiting for the next batch of French fries. Dad's popcorn popper sat on the back burner. Wasn't a night that Dad didn't use it. Next to the refrigerator hung the yardstick. I'm sure it was kept handy in case one of the rouge daughters got out of hand. It was a reminder that I might think twice before getting into trouble. Best of all was the old cupboard. As a tiny child, I was permitted free range of the pots and pans. I wore pots on my head, pounded pots with an old spoon and removed all the pans once in awhile so I could hide inside the dark cabinet. There was an old flour bin on the upper part. I was permitted to turn the crank releasing the flour into Mom's dish for her daily pie baking. The small window in the bin permitted me to view the flour level as it dropped when I turned the tiny crank. Memories. Amazing where we capture them and where we hold them waiting for a time when we take them out and once more look at them, experience them. Some of my dearest memories happened in an old kitchen that held an old sink, stove, cupboard, refrigerator, table and chairs. On the wall hung a blackboard for notes for the family and a place for visitors to let us know they stopped by when we were gone. It was the hub, the center of our family, of our home. Warmly is welcomed, quietly it embraced and when it was gone, it remained a treasure. Memories. Mine involved a pot on my head and bath in the sink. I hope your memories are as good as mine. I wonder if children who are raised next to a creek understand their luck. The creek bottom was such a part of our lives. Our cattle grazed there as did the sheep. My horse and I raced down the back lane to the creek. Before they dredged the creek, we could sit on the banks and fish. Crawdads were there for the catching. Turtles were captured and released. Frogs sang to us as we sat by the side of the creek just finding a place to be alone. Dad built his barn from the lumber in the creek bottom, thus clearing the area for his livestock. 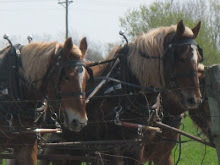 The lumber mill had been set up there close enough that the horses could pull the lumber up to the construction site. We sat under the trees when we worked in the fields eating the lunches mother brought to us much as those builders had done long before. 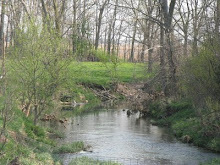 When I was a kid, Dad decided to have a section of the creek bottom planted with slow growing hardwood trees. The boy scout troop came with shovels and buckets of saplings. Before long the hillside was covered with baby trees. I think Dad planted the trees for his daughters. Their hope, I think, had been that one of us would cut the trees and build a house in that location. If no house, the trees would still be quite a financial asset for his kids. My oldest sister and I both talked about the possibility. Her life moved away from Ohio. I had hoped to stay closer to home but my journey west started in Wisconsin. Dad and Mom's three girls walked together to the creek each time they returned to the farm. We watched the trees grow straight and tall. Dad's vision had provided a home for wildlife and wild flowers and his children and grandchildren's memories. He was a man before his time. He realized the importance of trees. He realized the heritage those trees could give to his daughters. We did not cut those trees or build a house, but we came away knowing that Dad was an environmentalist and taught his daughters to be the same. The City. Traffic, tall buildings, buses on cables, newsboys hawking papers on every corner. Shoe shine stands and magazine stalls. Twenty-five miles from home sat the nearest city to the farm, Dayton, Ohio. It was a sweet day when Mom and Dad decided to spend the day there. Mom loved to shop at Rikes. We walked into the department store where we were surrounded by lights, sweet smells of perfume and elevators that took you to a place called the mezzanine. From a child's view, I could look directly into the beautiful glass cases holding sparkling jewels. Instead of the small sections of clothing, the store held floors of endless racks weighted with attire for all ages. At Christmas, the store windows were full of animated characters frolicking in the snow. Surrounded by lights and movement children pressed their small, shining faces against the glass. We always had lunch at the Virginia Cafe. Dad usually took care of me as we passed the down the line pushing our trays. Of course, Dad and I always had fish. It was our tradition. Little did I realize that the cafe sat next to the Mayfair, a burlesque. While we ate our filets, women in feathers danced next door and comedians 'yucked' it up for the audience. It was the city. Mom always stopped at the music store. She shopped for choir music and both of us dawdled over sheet music looking for something new to pluck out on the piano when we returned home. Dayton was a wonderful get-away from the farm and full of excitement. My first job was in Dayton. Engaged to a boy serving in Viet Nam, I moved to Dayton to work and wait his return. It was a time of unrest in the country. Dayton was not immune to the race riots and hatred that swept the country. Streets that once were fairly safe were now strewn with glass and charred vehicles. The city changed and with it so did I. 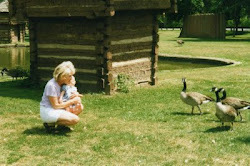 When I was a child, I returned from our trips to Dayton to the peace and safety of the farm. As a young woman, I found it hard to escape what I had seen and felt. Dayton had transformed me from an innocent girl to a woman who could not go back to Neff Road and ever feel the same again. Perhaps Neff Road was an age of innocence more than a place I lived. Farm kids grow up surrounded by a world of adventure. We grow up riding on tractors, roaming the countryside. How neat is that?!?!? I think I appreciated that special life. I didn't know anything else, but I did know that most days some adventure awaited me out there in the barn, in the field, by the creek. Wherever Dad went, I was his shadow. Our dog and I rode the tractor with him for hours, talking about anything and everything. Dad explained what he was planting or why he was plowing. We talked about nature, arrowheads and the many questions I asked. Sometimes we would stop by the woods and look for mushrooms. Dad always had time to tromp through the trees hoping I would find the tasty treasures. I was Lowell Thomas wending my way through the jungle. 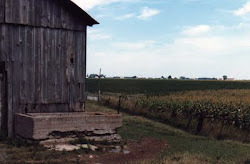 When Dad baled, I would beg to climb the elevator that carried the bales into the barn. When the scoop was on the front of the tractor, I was in it riding high above the ground. 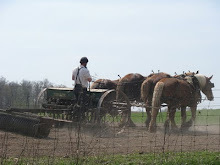 When grain was combined, I rode in the wagon with the wheat and then the oats pouring down on me. The barn was my playground where imagination created cowboys who rode on sawhorses, Tarzan who flew across the barn on the rope swing, an old version of Indiana Jones as I fought off pirates, invaders and wild beasts in the old barn. The corn crib was my house. The creek was my jungle. Farm kids have the best playground. Because of that playground, my imagination grew. I played out the stories in my head. This rural freedom gave me freedom to pretend, to dream, to become. My playground? My life on the farm. In my possession is a treasure that should be insured against loss or damage; however, there is no such insurance to cover such a treasure. I was just a toddler when I received this gift. In fact, as long as I can remember I have had it in my possession. She is 5' tall and has black hair, a fiesty spirit, four children and my memories. She has been my kindred spirit, my lifelong confident, my friend. We grew up next door to one another. Seldom did a day go by that we did not see one another. Our dream was to have a house built between our two homes so we could live in it and visit our respective families on rare occasions. Together we watched calves born, took baby chicks from box to brooder, watched headless chickens dance on the clothesline, played with cut out paper dolls, scoped out the barn for newborn kittens and loved playing house. Best of all, we went fishing with our daddies. We were maid (matron) of honor for one another Our struggles were shared. Over the years, our children grew to be friends in spite of the distance from Ohio to Oregon. We have shared laughter, joys, journeys, pain and more recently tears of loss. I think perhaps I'm the luckiest person in the world to have her in my life. She never asks for anything yet gives everything. Seldom do we write or call yet we know we are in contact. We have yet to build that house between our two respective homes. Would imagine that it would now be located somewhere in Kansas, maybe Nebraska or thereabouts. But never have I felt far from her. At times I would swear we are one in the same. Blonde hair next to black now blending into grey. School days to schools days, college to college, marriage to marriage, children to children, age to age. Tadpoles to fishing, dress up to wedding gowns, dolls to babies. Make believe lives to lives we would make. Quietly, I sat next to my mother in the balcony on the end of the row high above the stage. Ferrante and Teischer sat at pianos, fingers flying over the keys. A small farm girl sat enraptured, falling into the music and perhaps into who she would be. Our family was poor. We didn't have money to spend on frivolity. Entertainment came via the church and later television. I can only recall two movies I'd ever seen as a child. Yet our parents saw to it that we were exposed to something beyond the farm. Yearly my parents purchased tickets for our family to attend Community Concerts. Famous artists side-stepped their concert venues in order to hit the small outlying communities. Tickets were cheaper so families like ours could experience a world we could only imagine. This little girl watched a blind George Shearing woo his audience feeling his way across the piano keys. The Arizona Boys Choir delighted us. Children singing for this child. Dancer danced. Musicians played. Sometimes a magician showed his tricks. Orchestras drew me in. One of the greatest gifts my parents gave to me was that seat in Memorial Hall. Dressed in our finest church clothing, we drove to Greenville. Dad parked the car, and we walked up big steps, past the columns and into the Hall. Up the curved staircase we found our way to our seats. Each time a new adventure, a new experience. Doors were opened. Doors we children continued to open throughout our lives. Thanks, Mom and Dad. From a lofty perch, I found the music in heart. Early on in life I realized how many vacant houses and sheds scattered the landscape. Some I noticed still had curtains at the windows and even crockery in the overgrown front yard. Standing in a derelict state still wearing the signs that someone had just walked away never looking back. 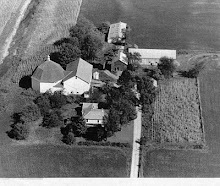 My great-grandfather's homestead was located in the middle of his farm acreage. My son and I decided some years back that we wanted to find the old house. We parked along the road, walked through the fields and over a rickety bridge spanning a raging creek. Finally, we approached to site and saw no house. Dejectedly, we debated our next move. As we did, a huge, bear-like ground hog looked down on us from a rise. It then dawned on me that we were standing where the barn once stood. The ground hog stood where the entrance to the barn had been. Excited as any explorers, we quickly climbed the hill. Still no house. Then I noticed the orange tiger lillies scattered at the end of the field. I knew that someone at sometime had planted them. Indeed someone had. My great-grandmother. The old two-story brick house had burned. No one bothered to rebuild it yet the brick still remained holding the memory of the children who were raised there. We walked through the rubble from room to room. This house held a story of deceit and death. Of a stern father and two families of children. It was the home of my grandfather. We loaded old bricks into our jackets and carried them out on our backs. Remnants of our past. Here in Oregon I still see empty houses. I wonder 'whose dream were you little house'? Who pounded your nails, cleared your land, who scrimped and saved to build your walls? Were you a retirement home or the dream or newlyweds beginning a future with each strike of the hammer, each stroke of the brush. First Christmases, new babies, fresh wallpaper, tiny handprints on new windowpanes. What memories filled those walls? Where did you go, you builders of this house? Why did you leave? How many came after you were gone? Was someone here for a long time layering wallpaper upon wallpaper, paint over paint? Or were there many families? More recently who painted the walls red and maybe yellow? Did this home hold dreams or demons? Were the windows covered to hide the secrets? Where did you go? Do you perhaps reside in an even smaller place with bars on the windows? With locks on the doors? Were you left behind, little house, when the death visited your door? What memories filled these walls? What was your life little house? Do you know you are forgotten? Vacant houses. Houses unloved. So many stories live in the lifetime of a house. I grew up in a house that was built of hand-hewn logs later covered with wood siding. Native Americans lived by the creek that ran through the farm when this house was built. What stories were hidden in those wall? Who were the people of our land? We were just visitors there. Someone new moves in and what was once new is new once more. Fire. A couple of rocks and some twigs and mankind evolved. Fire. We had electricity on the farm. Our Amish neighbors did not. Driving past their homes in the evenings, I could see their lamps flickering. I was rather envious of the romantic glow, of the simple life. Dad had an old, oil lamp he kept in the back room. When storms hit and lights flickered out, the lamp was lit. On those occasions, we all huddled in the basement around the fireplace. We relished those times. That fireplace was the center of our winter activities. The youth group kids would come to roast wieners followed by roasted marshmallows. Dad would bring home fish and fix them over the fire. Fire. The warmth of the hearth. In the summer, we used the brick fireplace outside. It was a summer kitchen where once more hot dogs, marshmallow and neighbors became an event. When my father died, my best friend, Brenda, gave me a candle to burn in memory of Dad. A few month later the candle was burned at my daughter's wedding in memory of those who were no longer with us. My son will marry in January. He and his bride will each light a candle for the same. Each year on 9/11 I burn a candle in memory of a day etched in the hearts and history of Americans. Fire. Remembrance. Maybe Ben and his kite discovered something wonderful, but I prefer my hot dogs over an open fire, reading by candle light, smelling the ancient scent of a burning log. Fall. Mmmmmmm, a good book and a fire. The Sunbeam Bread truck pulled into the driveway. I would run from the house to the big yellow truck. The delivery man walked around the truck visiting with Mom while opening the back of the truck displaying the bread. 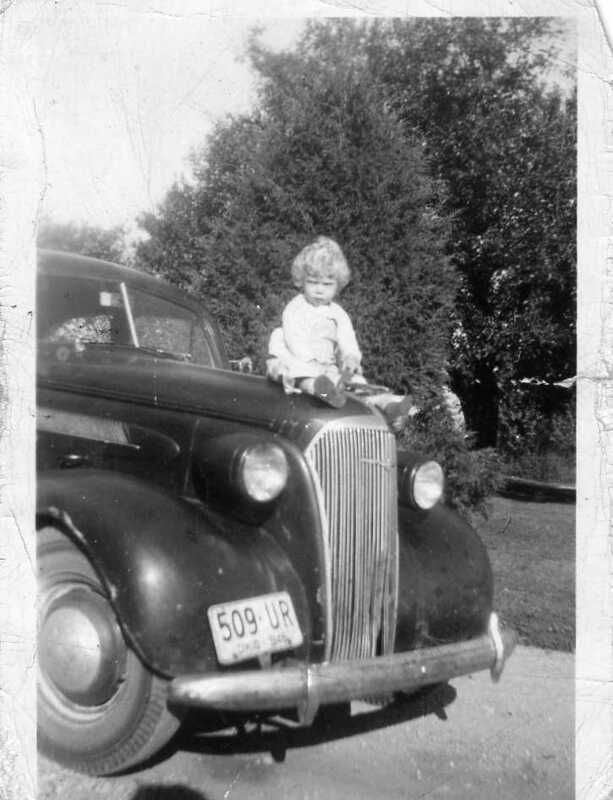 When Mom was finished shopping, I eagerly climbed onto the truck bumper for a chance to peek into two thin drawers that held candy for the kids. It was a good day when that yellow truck came to visit. Once in awhile a Bible salesman would stop in to visit a house already brimming with Bibles. He would come in and chat, drinking coffee and having a piece of Mom's fresh-baked pie. The same was true for the Fuller Brush man who carried in his cases of combs and brushes, and the Watkins man hawking his liniments and salves. Mom visited with them while checking the new items, hoping for free samples. I hung around just in case there was some freebie for little kids. Our milk was delivered at home. Bill, the milkman, would come into the house if no one was at home and put Mom's milk order into the refrigerator. Sometimes Bill would even stay for breakfast. Gone are the days of the Watkins man, the Bible salesman, bread and milk delivery. Gone are the days of visiting with a stranger over pie and coffee. No more do we leave our homes open to the neighborhoods we trust. Even more, gone is the security and peace that was once a place and a time I knew. Neff Road was a good place back then. My own nirvana. Okay, lets get this straight. I'm not really talking lions and tigers and bears, although I feel like I might as well have them in the backyard. Cats and squirrels and blue jays, oh my. My bird feeders are constantly under attack. The squirrel collar on the post of the feeder, the squirrel pepper powder scattered around the post, the flower pots on the deck railing and the 'squirrel proof' bird feeders do not deter already fat squirrels and cats whose owners forget that they live in town where cats are not free-roam. I can do nothing with the blue jays but stare at their beauty. We had pests on the farm. I never saw rats, but my sisters swear we had them. I know we had mice. Rodent proofing was impossible in an old two-story log house; mice infiltrate. Of course, the barn was home to mice and birds. Dad would often chase away or cart off barn owls who loved to warm themselves in the dark recesses of the barn. Occasionally, we were visited by larger creatures. Once while searching for the most recent batch of kittens, I started to reach into a barrel from whence (British roots) hissing occurred. I pulled back a piece of burlap to find a possum baring teeth at me. The scream heard around the world. Raccoon would mosey around the chicken house hankering for an egg or two. Ground hogs would lumber along the creek resembling small bears. Once in awhile a skunk, who obviously had been conversing with the raccoon, would try to find breakfast as in the hen house as well. Hawks soared overhead looking for something small to carry away. And, a couple of times I had even seen a fox probably hoping to bypass the eggs and go straight for the chicken. My predators are benign in comparison, yet I claim these birds as mine. The cat has a bowl at home, someone is feeding the squirrel corn and peanuts. (I know because I find them buried in my garden.) Some days I'm tempted to add a squirrel and a cat to my garden but refrain from violence. I could do what Dad used to do and sit with a shot gun waiting for a varmint to show up, but I don't believe in guns. Or maybe trap the critters and make little fur jackets for hairless dogs. It is a quandary how man and beast should live together. I am gaining patience from this standoff as well as sprinting and leaping prowess in my attempts to foil bird-devouring efforts. Ah, lions and tigers and bears, oh my. Where the heck are my ruby slippers when I need them. In 1708 Alexander Mack formed the Schwarzenau Brethren in Schwarzenau, Germany. As members of this congregation migrated to the United States, they changed the name to German Baptist Brethren or Dunkards. In 1880, again the church changed when the German Baptist broke away so they could retain the simple dress and customs while the other portion of the church became the Church of the Brethren. The church, my birth church, emphasizes peace, simplicity, the equality of believers and consistent obedience to Christ. They are a peace loving congregation who believe in not saving the world for Christ but more so in saving the cultures, the people, for themselves as brothers and sisters because that is what we should do for one another across oceans, across prejudice and poverty..
Our church had many customs held over from the Dunkard past. Communion meals with feet washing and the holy kiss. Immersion baptism for those who joined the church. Children were dedicated to the church for the church to support and nurture but joining the church was a decision the child made when he or she was old enough to make the choice. It was a rather wonderful way to grow up learning to humble oneself when washing another's feet. When I was a teen, it finally hit home. We were having the love feast from the last supper consisting of broth and bread. After the meal, we had the communion of unleavened bread and juice. (no wine in the Brethren Church). 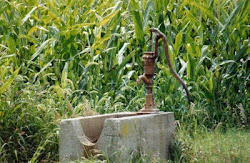 I girded my waist with a long towel and knelt before an older, heavy-set farm woman. Gently I lifted each foot into a basin and splashed her feet with water. After, I placed her foot one at a time in my lap and dried each. I then tied the towel around her waist, and she did the same. At the end of the sweet ceremony, we placed a kiss on one another's cheeks. Giving and receiving. Serving and being served. I was a child who stepped forward to ask to be part of this congregation. Baptized by immersion in water, I was joined with Christ in a ritual ages old and yet still new. When my children asked to be part of the Community Church we were attending here in Oregon, they both asked to be immersed as I had many years before. It was an unusual request and an emotional one for all of those standing around the stream watching. A simple life. A simple faith. Serving others was a privilege and an honor. Others need not believe what I believed but could be encouraged them to believe in themselves and what they could achieve. Prejudice was wrong and good actions could change the world. I was proud of my children for stepping back in time, for realizing what baptism felt like from the inside out and the outside in. No longer do I belong to the Brethren church , but in my heart I am still that simple girl with that simple belief. It was good to be part of Painter Creek Church. It still is. Anyone my age will remember the old wringer washer. What an experience! Had it not been work, it might have been fun. Mom had the old wringer washer in the basement so we could run dirty wash water into the basement drain. Clothes were separated by whites, lights and darks. The washer was filled with water, soap added and the clothes agitated. First the lights were added then passed through the wringer into the rinse tub. The wringer consisted of two rollers on the upper part of the washing machine. Flat clothes came out the other side of the rollers and fell into the big tub (which was sometimes used for bathing) of clean water. Next came the light colors followed by a load or two of darks. One tub of water and detergent = three to four loads of laundry. The wet clothes were then taken in the summer to be hung on the outside clothesline. In the winter they hung in the basement. Monday laundry was an experience. I loved doing laundry with Mom. My job was running the clothes through the rollers. I got to do it twice. First the washed clothing went into the rinse water, then the rollers were turned over the rinse tub so I could pass the rinsed clothing through them once more dropping flat clothes into the clothes basket. Wow! It was better than any old video game. I'm smiling at the good 'ol days. I can still smell the soap and wash water. Mom's old detergent container sits atop the back of my stove with old soap still clinging to the bottom. Sometimes I peek inside and once more I'm transported back in time. A wonderful time. Anyone who lived in Darke County knows what 'around the circle and out to the Big Boy' means. I wonder if the ritual remains? For generations, Saturday afternoons people gathered in downtown Greenville to visit with neighbors. The women would shop and the men would sit on the wall outside of the courthouse visiting. On Saturday nights, the teens descended into downtown Greenville driving down the main drag and out to the Big Boy restaurant then back into dtown around the circle down and back again. Over and over all evening long. Cars stopped and traded people. Kids leaned on cars at the Big Boy visiting and flirting with passing cars. I think to some degree it was a release for farm kids from the boredom and seclusion of the farm. Driving that loop added us to a bigger world, to a wider range of possible new acquaintances. On winter Saturday nights, we all went to Greenville to the Armory dances again for all the same reasons. We met town boys there. I danced in my blue velvet dress. And, we drove around the circle of town enough times to make a person dizzy. Now the kids hang at the malls or on the streets. I cringe when I run into a mob of rude young adults who lack consideration for other people. Skate boarders dodging in and out of pedestrians, teens texting and talking on phones, seven kids in a car and five seat belts. It's a different world these grandchildren of ours face. Yet aren't they looking for the same things. Friends, possible love interests, fun, escape. I wonder what kind of kid I would be now? I shake my head at the kind of kid I was then. I look forward to driving around the circle again some day soon and maybe even out to the Bob Evans that stands where Big Boy once stood. My crowd is much older and moves much slower.....and probably not nearly as fun. Ah, sweet youth. Once when my son was making a call home from Chicago, I heard the thunder echoing in the background. Unless you have lived in the East or Midwest, you cannot appreciate the true essence of a thunderstorm. Texas has incredible lightening, Oregon has wonderful rain showers but the humid East has fantastic storms. The mighty thundering not only rattles the rafters but can shake you down to your bones even as the sound fades away. When the kids were young and we visited the farm, we would sit inside the screened-in porch watching the storms pass thinking how brave we were to stand so close to this incredible power when in reality we were scared down to our toes. On one such trip, my son was standing alone on the porch as the rest of us were smart enough to stay inside. He ran in screaming that the lightening had struck at the neighbor's place. The next day we walked down the lane to their home curious about the lightening damage. Victor took us to the back of his property where two trees stood about 4' apart. Lightening had struck the top of one tree, splitting the bark as it traveled to the roots where the lightening continued to travel up the bottom of the second tree leaving a charred trail. Ever been in a thunderstorm back East? Indeed it is impressive. Perhaps it is nature's humbling reminder of her power and our vulnerability. When fall came to the farm, we knew that winter was not far behind. Dad would take down the screens on the house. Mom would put the comforters and down feather beds on clothes line to air out from their summer hibernation. Fuel oil was delivered and wood for the fireplace piled by the basement door. Mom canned food to stock the fruit room in the basement. Noodles were made from scratch. The best noodles in the entire world. Soap was made and winter clothes aired out and mended. Dad closed up the barns. The sheep were growing fatter in their winter coats. Equipment was oiled and put away until next spring. The corn crib was full of corn recently picked, the barn full of hay and straw. The barns and chicken coop were cleaned and fresh bedding added. Tobacco hung in the shed waiting to be stripped. We settled in for cold weather, a new season. The old seasonal rituals still echo as I take winter bedding from the closet, shake out the rugs. I look forward to snuggling down beneath the fluffy comforter pulled up to my nose. Even more, I look forward to having a warm house which I didn't as a kid. I think maybe I'll toss a log on the fire tonight. My fall rituals have begun. Like something out of Disney animation it hung on the wall so high that I couldn't reach it. Many times I remember wondering how it could be so magical. It was marvelous. To this small child it resembled a comical face with two small, golden eyes and a cone-shaped nose that moved up and down according to the speaker's height. On one side it had an conical ear dangling from a cord, on the other side a crank-shaped ear. The slanted platform at beneath the nose resembled a large, gaping mouth. Sometimes the little eyes would ring when the little hammer struck them. Two long rings and a short. Someone would pick up the drooping ear, lean into the nose and talk. Mother would often lean into the nose and ask for Aunt Welma. Sure enough, she would be talking to her in just a few minutes. Yes, it was our crank- telephone. Gone are the days of two longs and one short. Gone are the days of asking the operator to ring up a neighbor. The phone no longer resides on the wall but in a pocket. Heck, you can even talk without using your hands...or voice! Something seems to be missing. I miss a system of people who made that bell ring on that funny-faced box, the people who listened in on the party line, those who were there to help immediately in case of emergency. I think most of all I miss the operator who knew that the doctor was needed at the farm to check on little Pam who was sick. 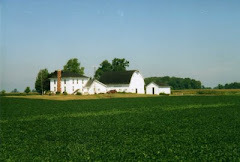 My great-grandfather had a large homestead just outside of Bradford, Ohio. Back then it was the beginnings of a bustling little village. Later, after the railroad ceased to stop in Bradford, the town became another little sleepy, Ohio town. But life comes to this sleepy town once a year. The Bradford Pumpkin Show settles in. People from all over come to savor the food, hear the bands, meet up with old friends. Of course, there is a princess and court who reign over the festivities and pumpkins, I guess. And, when I was young, food stands, craft booths and side-shows lined the sidewalks. This, however, was not just a typical carnival or fair for one reason: Confetti. For 15 cents we could purchase a small bag of those little round paper-punched holes which we then delighted in throwing at people we knew. I'm not sure if this was a sign that we liked the 'confetti recipient' or a way of showing our true feelings of aggression. We walked up and down the street time and time again just waiting 'confetti' someone while hoping that you weren't a target. By the end of an evening, the confetti in the street was sometimes 6" deep. Everyone went home with confetti in hair, eyes, down clothing, hidden in shoes and more than likely filling pockets. It is once more about time for the Bradford Pumpkin Show. Do they still have confetti? I don't know. It was certainly the epitome of littering and wasting paper. And, why did we enjoy tossing confetti and eating the stuff when you forgot to dodge? Boy, it was fun. My question….Why?